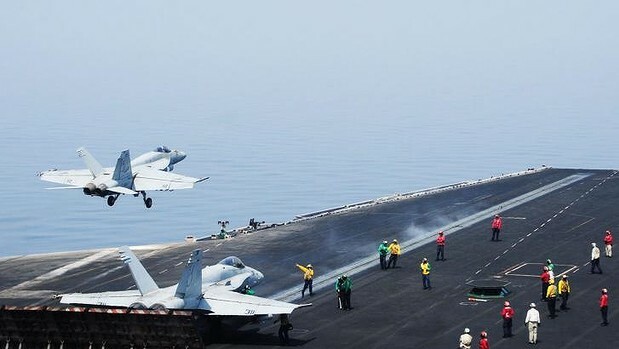 An F/A-18E Super Hornet takes off from the aircraft carrier USS George H.W. Bush in the Persian Gulf, as US air strikes in Iraq begin, August 8, 2014. (AFP/US Navy via http://images.smh.com.au/). In public domain. We’re back at it in Iraq again, albeit on a limited basis. Humanitarian food and medicine drops, airstrikes on ISIS positions near the US consulate in Erbil (also an oil depot, by the way). The saga that has been the twenty-three year quagmire of Iraq, one entirely of our own making, continues. That President Barack Obama has called this intervention one in prevention of “genocide” doesn’t impress me and many others, considering the actions of Israel in Gaza over the past six weeks. I guess one nation’s genocide is another nation’s defense through indiscriminate killing and wounding. The hypocrisy stinks from here to Pluto and back. I digress. Americans now loathe the words “Iraq,” “Middle East,” and “intervention.” Yet after Vietnam, and especially after the end of the Cold War, we should have held our government accountable for any interventions without clear causes, clear interests, and clear objectives. Instead, we’ve been stumbling all over the place, like a drunkard with a car full of bombs and shells, careening from one conflict to another, blowing up people, places and property all along this wild and disgusting ride. But let’s not act as if this was unforeseen. The most astute foreign policy experts withoutPhDs in Soviet studies (e.g., Condoleezza Rice) knew that any major intervention in the Middle East, whether to protect people or US energy interests, would mean intervening over and over again. All with the potential for geopolitical instability as the interventions would stack up over time. 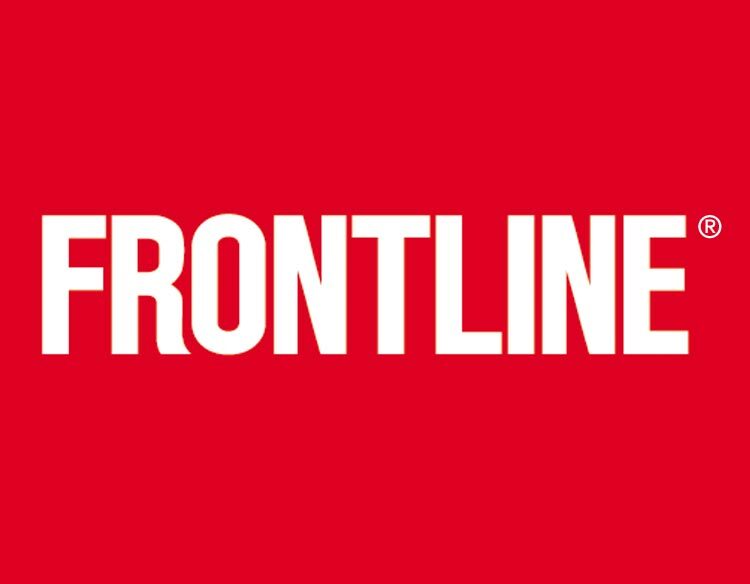 FRONTLINE logo, PBS, August 9 2014. (http://www-tc.pbs.org/wgbh/pages/frontline/art/bigfl.jpg). And no, I’m not talking about a 1993 report from the Center for Strategic and International Studies or a 1999 conference hosted by the Carnegie Endowment for International Peace. That would be far too obscure and inside-expert to be clairvoyant. Try PBS’s FRONTLINE series of documentaries between 1990 and 2000. They did at least three documentaries predicting this gradual but steady destabilizing of the Middle East with the help of an increasingly interventionist American foreign policy, starting with Operation Desert Shield in August 1990. FRONTLINE examines how Saddam Hussein built Iraq’s massive arsenal of tanks, planes, missiles, and chemical weapons during the 1980’s. Correspondent Hodding Carter inve[s]tigates (sic) the complicity of the US, European governments, and Western corporations in creating the Iraqi military machine the world is now trying to stop. FRONTLINE explores the bitter divide between military and civilian attitudes about where, when, and why America employs military force. In examining the gulf between what American diplomats want and what the military is prepared to deliver, correspondent Peter J. Boyer follows the inevitable collision from Vietnam to the Balkans between diplomat Richard Holbrooke and Admiral Leighton Smith. Their careers, and ultimate clash, represent the most vivid example of this critical foreign policy dilemma. The U.S. Army is experiencing an identity crisis brought on by the end of the Cold War. As it heads into the 21st century, the nation’s largest military service is struggling to keep pace with changing technology, changing enemies and increasingly global missions. FRONTLINE examines the Army’s internal debate between those promoting change and those resisting it, and how todays decisions may impact the outcome of wars fought decades from now. 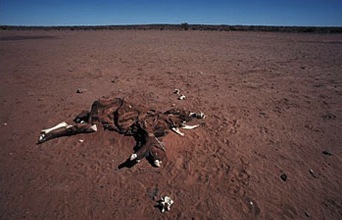 Emaciated and dead cow in desert, Australia, 2009. (Government of Australia via http://www.nsf.gov/news/). The last one actually included examples of possible future interventions going into the late-2010s, with a particular focus on Iraq. So to those millions of Americans who don’t want to dwell on the past and only talk about the vapid and the positive, I say that’s hard to do when we let our past fester like carrion in the middle of the Sahara Desert at high noon. The stink is too obvious to ignore, and apparently was so easy to predict that most Americans ignored it. And all to our peril, past, present and future.